PUNE, INDIA--(Marketwired - Mar 17, 2014) - Saluting the spirit of womanhood, Courtyard by Marriott Pune City Centre celebrated International Women's Day with a practical self-defence session for all the lady associates of the property by martial arts expert and Limca Book of Records winner Mr. Shihan Chakraborty, Founder & Master of Indian Karate Do Kyo Kushin Kai. The Pune hotel also conducted a free eye check-up camp for the less privileged women in association with Hope for Children Foundation. Acknowledging the vital need for women to be confident and independent, Mr. Shihan Chakraborty taught the ladies some practical self-defence moves to ensure their safety in times of danger. As a part of their Spirit To Serve activity, the business hotel in Pune also assisted the Hope for the Children Foundation in conducting free eye check-ups for the less privileged women. This was followed by a dessert making class for them by the expert chefs at the hotel which will help the women strengthen their culinary skills to support their catering business. Speaking on the occasion, Mr. Gagan Deep Singh, General Manager of Courtyard by Marriott Pune City Centre said, "We understand that women today need to be fully equipped to protect themselves and we hope to have motivated our women associates to learn more about self-defence and in the process contributing to their safety. We have always associated with Hope for the Children Foundation and we will continue to strive for the betterment of the society by doing our bit for it." 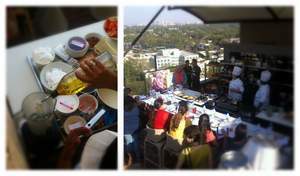 In order to polish up culinary skills, the hotel also conducted a masterclass by the leading lady chefs Rama and Keshia and mixologist Mayuri at Evviva Sky Lounge, a popular lounge in Pune. Marriott International, Inc. (NYSE: MAR) is a leading lodging company based in Bethesda, Maryland, USA with more than 3,700 properties in 73 countries and territories and reported revenues of over $12 billion in fiscal year 2011. The company operates and franchises hotels and licenses vacation ownership resorts under 18 brands, including Marriott Hotels & Resorts, The Ritz-Carlton, JW Marriott, Bulgari, EDITION, Renaissance, Autograph Collection, AC Hotels by Marriott, Courtyard, Fairfield Inn & Suites, SpringHill Suites, Residence Inn, TownePlace Suites, ExecuStay, Marriott Executive Apartments, Marriott Vacation Club, Grand Residences by Marriott, and The Ritz-Carlton Destination Club. There are approximately 300,000 employees at headquarters, managed and franchised properties. Marriott is consistently recognized as a top employer and for its superior business operations, which it conducts based on five core values: put people first, pursue excellence, embrace change, act with integrity, and serve our world. Saluting the spirit of womanhood, Courtyard Pune City Centre celebrated International Women’s Day with a self-defense lesson for all the lady associates of the property by a martial arts expert. They also conducted a free eye check-up camp for the less privileged women in association with Hope for Children Foundation.